One of my tweople sent me a great @glutenfreeway tip about Deano's Gourmet Pizza offering gluten free pizza at The Grove. I was over at The Grove today mailing out the final paper of my first year in law school (finally!) and decided to stop in at Deano's. I had a bit of trouble finding it (it's close to the Farmers Market Place entrance, by Starbucks and Pinkberry) but once I did I was really excited. The cashier told me that all pizzas could be made gluten free; however you can't buy pizza by the slice. But don't worry, the smallest size of pizza is small enough for one (and can even be split for two meals). I ordered the Pesto Spinach Garlic Shrimp and it was delicious! It cost about $10 and was definitely enough for dinner and lunch. Deano's also makes all of their pasta gluten free, but the only use gluten free spaghetti in making the dishes. 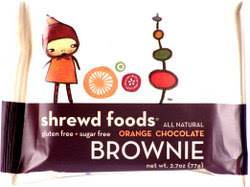 A reader just informed that Miss Bobbie's in Orange County (Tustin, to be exact) carries the line of packaged gluten free brownies that I blogged about earlier (see that post here). For all of you Orange County readers, this should cut down on your commute up to LA to get some great gluten free treats. My old roommate Vanessa and I, along with our friend Betty, went to Mani's on Fairfax today for a quick breakfast. I knew about the great special they are currently running (Monday-Friday before 11am all breakfast orders are only $9) so we took advantage and headed down to Mid-Wilshire. Of course, it shouldn't go unmentioned that we also made a late night stop at Millions of Milkshakes after dancing our way through The Abbey and Apple. I love Millions of Milkshakes (check my previous post here) but I'm not sure it was the best idea for a late night snack...See my previous post about Millions of Milkshakes here. Vanessa and I always make sure to check out the baked goods displayed at the front of Mani's so we know what to expect for dessert. I was pleasantly surprised to see that there were slices available of the restaurants Dark Chocolate Mousse Cake. 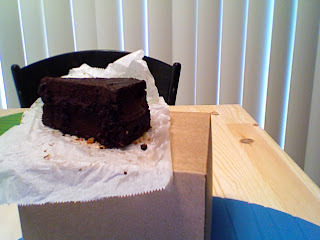 I've tried the bakery's peanut butter bites, caramelized apple cake, and lemon poppy muffins, but had never seen the Dark Chocolate Mousse Cake Available (check out my previous posts about Mani's here and here). 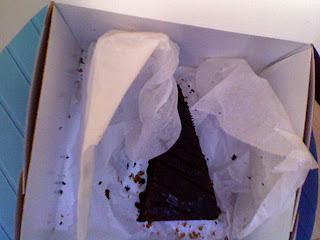 I made sure to pick up a slice of the Dark Chocolate Mousse for later... and later is now! I just ate the slice and it was amazing, in a word. It had a slight hint of raspberry (or at least I thought so) and was really great. There is one downside, however: it is expensive! The slice cost me $6.75 this morning!! In these tough economic times it's difficult to justify that, but as an infrequent treat the Dark Chocolate Mousse Cake is the way to go. Also, on a sidenote, I'd like to wish everyone a happy and healthy Memorial Day weekend. For you people trying to lose those extra pounds before you start spending weekends in Malibu or for the athletes out there, below are some gluten free advisories concerning sport drinks. 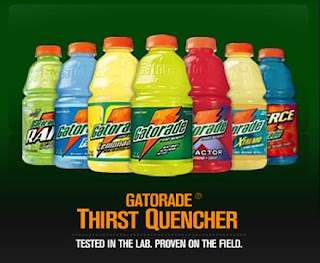 No, none of our Gatorade products contain wheat ingredients, which would be the source of wheat Gluten." Gatorade is a great alternative to water because it contains electrolytes that replenish the body's water and electrolyte levels after the dehydration that exercise causes. It's also my personal hangover cure; but hey, that's just me. However, as many people rightfully claim, it is loaded with sugar. A better alternative might be SmartWater, which is pumped with electrolytes similar to Gatorade but doesn't carry all the nasty sodium that Gatorade does. Just got off the phone with Powerade, a Coca-Cola product. The representative confirmed that ALL Powerade products are gluten free! 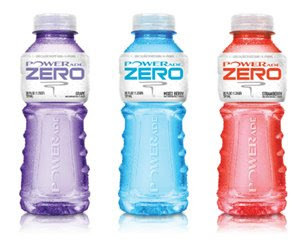 This is great news -- my friend Aileen has always preached the hangover cure that is Powerade Zero. Powerade Zero is a zero-calorie sports drink charged with electrolytes to help you replenish after exercise (or a night on the town...). 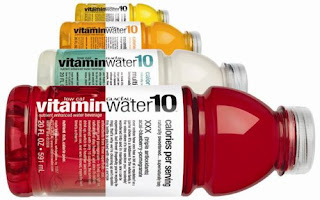 More great news -- ALL Vitamin Water and Smart Water is gluten free! Made by Glacéau, Vitamin Water is a great alternative to Gatorade and Powerade. The brand just released a 10-calorie line, so it's another great way to recharge after exercise without all of the calories that are in regular energy drinks. Note: this gluten free extends to Vitamin Energy Paks. 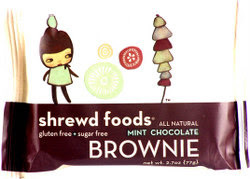 I'm not sure what these are, as they have been discontinued and are no longer available, but the representative wanted to assure me that if you owned them already there is no need for concern; they are gluten free friendly! A better alternative to Vitamin Water/Powerade/Gatorade might be SmartWater, which is pumped with electrolytes similar to the flavored drinks but doesn't carry all the nasty sodium that those drinks do. I can't taste any difference between SmartWater; perhaps you more discerning Celiacs can. I also know that Trader Joe's makes their own electrolyte charged water. Here there is a gluten free listing of all of Turtle Mountain's gluten free products. You probably don't recognize the name "Turtle Mountain," but I'm sure you recognize the label in the above picture. 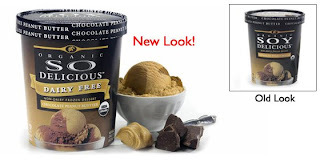 The company makes a ton of great dairy free products for those of us Celiacs who have problems with dairy. I have cut it out entirely out of my diet and feel 10x better than I ever have before. 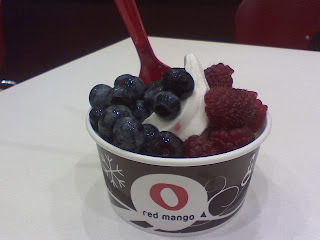 I live off of Whole Soy & Co's yogurt (see my post here) and really like Turtle Mountain's products too. I just tried the brand's creamy vanilla ice cream. I really enjoyed it -- I thought it kind of tasted like a vanilla cake! After eating a bit of it though, the flavor waned a bit and tasted a bit more icy. I definitely enjoyed it enough to buy the product again and to continue eating the brand's other products. Check it out here -- Olive Garden has great recommendations for the Celiacs out there. Make sure you click on the center tab that says "Gluten Free"! There is no more direct link available. They don't have gluten free pasta yet and please remember, there is always a concern with cross-contamination in kitchens that also use gluten. Please warn your server to clean utensils/dishes/etc. before using them to prepare your food! There's a good variety of food here, except not for the vegetarians or vegans out there. Maybe the appetizer salads are good for vegetarians or vegans out there, but since they are appetizer portions they may not be filling enough for a full meal. Fleming's Steakhouse offers a great gluten free menu full of options for us Celiacs. They just opened up a location around the corner from where I live in the new L.A. Live complex. I'm really excited to see all of the options available, but am missing one key option: the curly fries! 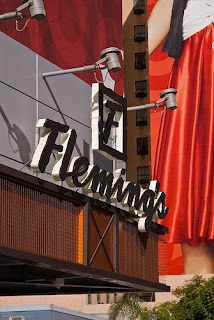 I absolutely love the curly fries at Fleming's (or used to) and am sad to see that they aren't on the menu. 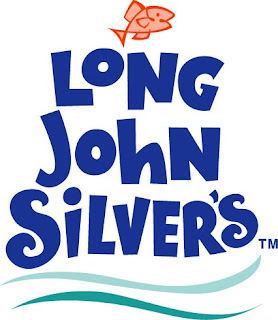 I assume it's because of the possible cross-contamination with the fryers. Just found this on YouTube -- the portion of Elisabeth Hasselbeck speaking with Sean Hannity about Celiac Disease (instead of politics). Of course, it devolves into politics/fluff around the 3:20 mark. Finally! Confirmation that Pinkberry is, indeed, gluten free. While I posted about this in one of my very first blog posts (oh I was such a novice back then... click here to be taken on a trip down memory lane), I couldn't find the confirmation that the yogurts were indeed gluten free. Never fear! I just received an e-mail from a Pinkberry representative who I connected with over Twitter. 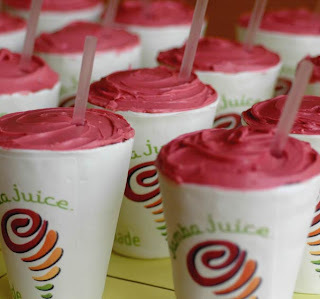 "Pinkberry is made with REAL nonfat yogurt, among many other natural ingredients, that gives it a refreshing, tangy taste. Pinkberry is fat free, gluten free and does not contain any pork products. We work tirelessly to find the highest quality ingredients and provide you with best-tasting, real nonfat frozen yogurt so that you will never have to question “the truth” once you have your first bite of Pinkberry." The gluten free question is also answered on Pinkberry's official website here (thanks @GlutenGossip)! Now you know that Pinkberry is a great source to help you enjoy the hot summer in L.A.! P.S. Follow me on Twitter here. It's free and a great way to connect with other Celiacs! 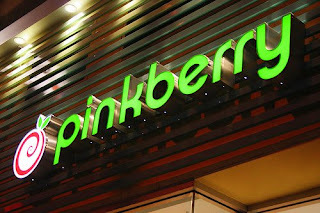 You can follow Pinkberry here. 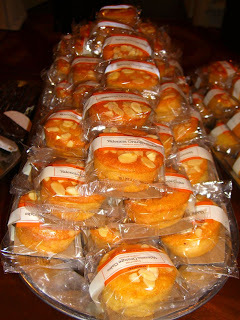 Today, DailyCandy featured a Babycakes recipe in its Daily Candy New York daily e-mail. Thanks to Caitlin and Ariel for forwarding this along to me! DailyCandy is a great site that offers daily updates about local parties, restaurant openings, gallery openings, etc. in your city. I subscribe to the L.A. version and it keeps me in the know as to what is going on in this crazy city around me. Enjoy! And don't forget that the Babycakes cookbook is available through Amazon here. 1. Preheat oven to 325°. Lightly oil a 7-by-4-by-3-inch loaf pan. 2. Pour the rice milk and vinegar into a small bowl; set aside. In a medium bowl, whisk together flours, baking powder, xanthan gum, and salt. 3. Add oil, agave nectar, applesauce, vanilla, zest, and lemon extract to dry ingredients and stir until batter is smooth. Add milk/vinegar combo and combine just until blended. 4. Pour batter into prepared pan. Swirl raspberry preserves through batter and bake on the center rack for 35 minutes, rotating the pan 180° after 18 minutes. The teacake will be golden brown and springy, and a toothpick inserted in the center will come out clean. 5. Let the teacake stand in the pan for 20 minutes before inverting onto cake stand. Serve warm with preserves on top. 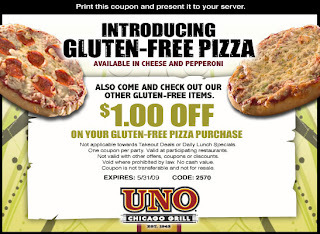 Check it out here -- a $1 coupon for gluten free pizzas at Uno's Chicago Grill! Unfortunately there are no L.A. Locations. Don't forget to check out Martha Stewart today! 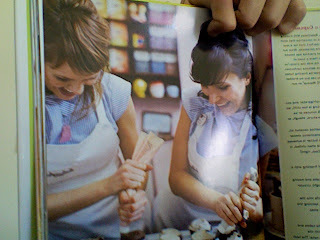 Erin McKenna, of Babycakes fame, will be visiting Martha and teaching Ms. Stewart some of her favorite gluten free, egg free, and dairy free recipes. I've embedded two YouTube clips of Erin's prior visit to Martha. Unfortunately, due to a recent snafu, my Facebook account was disabled. It turns out that accounts are only for individuals and that all businesses/celebrities/etc. accounts are designated as "Pages." Either way, you can now follow Gluten Freeway LA here on Facebook. I'll be adding more to my page as time goes on, along with some exclusive content not seen on my blog. If you're not already a member, consider signing up -- it's fast, free, and a really great resource to connect with people. I've been on it since the early days (back in August '04 when I started college) and think it's a great way to connect with people. It's similar to Twitter but with more advanced features. If you prefer to tweet, you can follow me on Twitter here. I just received an advance copy of the Babycakes cookbook and I must say that I can't wait until finals are over to start making some of these delicious recipes! The cookbook is available here on Amazon. Regular readers of my blog know that I am a big fan of Babycakes (having posted about it here, here and here). 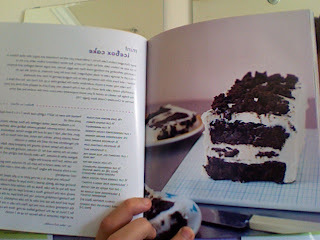 I was so excited when I got this advanced copy and wish I had more time to start baking! 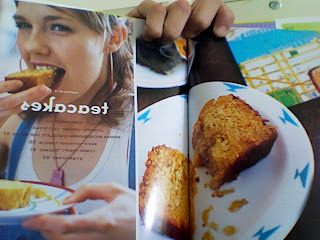 The book is great and includes beautiful photographs of the food that Erin McKenna will teach you how to make! Ms. McKenna also includes storing tips for the baked goods, testimonials from celebrity fans (Natalie Portman and Jason Schwarzman included), and a nice "Tools of the Trade" section that teaches novices (like me!) about how which tools are necessary for certain tasks. While I can't yet comment on the recipes included and the instructions as per those recipes (sorry, law school finals are keeping me busy), I'll be sure to update once finals are over and I delve into making some of these delicious recipes! 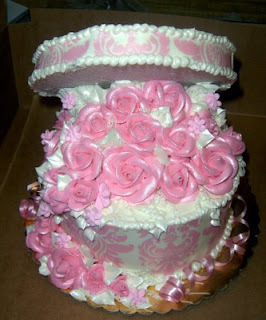 I can't say it enough -- I love Babycakes and can't wait for it to open its shop out here in L.A. In the meantime, go to your local bookstore and buy a copy of the Babycakes cookbook to whip yourself up some delicious baked treats! 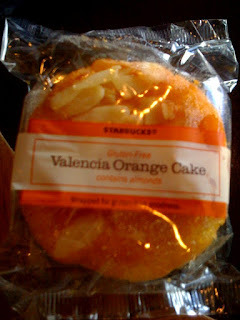 Just a reminder: Tuesday, May 5th is the national roll out of Starbucks' Gluten Free Valencia Orange Treat! While I haven't been able to get my hands in one, Diane over @ The W.H.O.L.E. Gang did and has written a review available here. Please note that while Tuesday may be the national roll out, stores will be carrying the products at different times and the product may not be available at your local shop. The image below is also thanks to Diane. I guess now my original post "Starbucks Going Gluten Free" is irrelevant... oh well, I'd rather it be irrelevant and have gluten free food available! Hopefully, this will be taken to the next level and Starbucks will offer sandwiches similar to the one I found in a Starbucks in London. So beginning Tuesday, May 5th show Starbucks how important it is to continue creating gluten free products by buying an Valencia Orange treat! Check out Starbucks' full blog post about the product here. I've never been to an A & W Restaurant (I can't even recall the last time I've seen one!) but I do love good root beer floats. Luckily, us Celiacs have this great guide to eating at A & W restaurants. However while the guide is very helpful in determining what us Celiacs can and cannot eat, it looks like there is no food on the menu safe for Celiacs! It is unclear to me why this is the case -- whether the burgers are made with breadcrumbs or if it is the buns that are served with them that make them inappropriate for Celiacs. 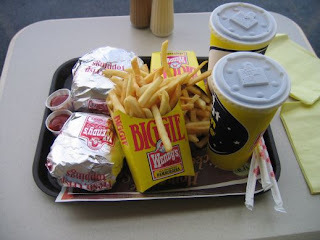 Have any readers out there eaten at an A & W and had a positive experience? While many of the shakes and floats are marked gluten free, there doesn't seem to be any solid food on the menu that is GF. In any case, at least now you know that most of the floats and shakes there are GF! Note: The Restaurant Locator has not been working for a few days and so I cannot include a list of CA locations. 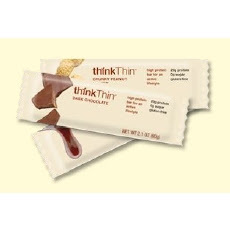 There is a great coupon available on the ThinkThin website (here) for 50 cents off a ThinkThin bar! Check out my previous posts on my love for ThinkProducts here and here.